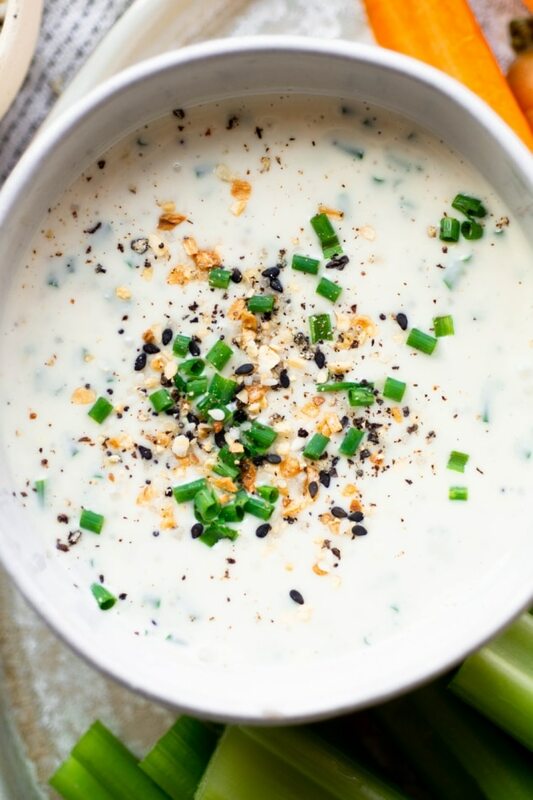 This dairy free everything bagel spiced ranch dressing is made with a few simple + clean ingredients that you probably already have in your refrigerator and pantry! 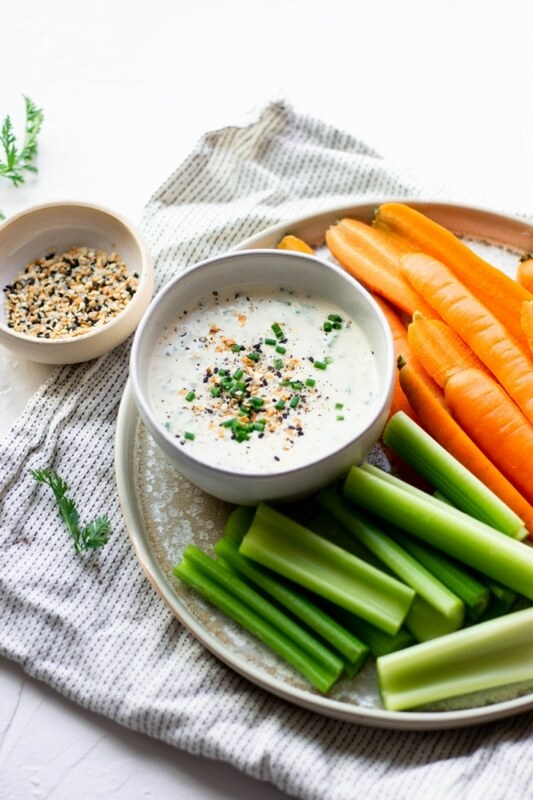 Ready in 5 minutes and so delicious for dipping veggies or as a dressing for your favorite salad. A healthy and tasty alternative to store bought ranch. AKA I love ranch dressing with my whole heart and I don’t care who knows it. And I’m guessing that if you’re reading this you also love ranch, and you’re probably also looking for a healthier option than the store bought stuff. 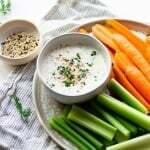 And guess what – I’m ALSO down with a healthier homemade ranch because eating the foods you love doesn’t have to mean sacrificing your standards. Basically what I’m trying to say is that I’ve 100% got you covered. How many different things can I eat with everything bagel spice? As it turns out – many, many things. And it also turns out that it is particularly good when added to some homemade dairy free ranch dressing. It already has a lot of the spices that go into ranch anyway – onion, garlic, etc. 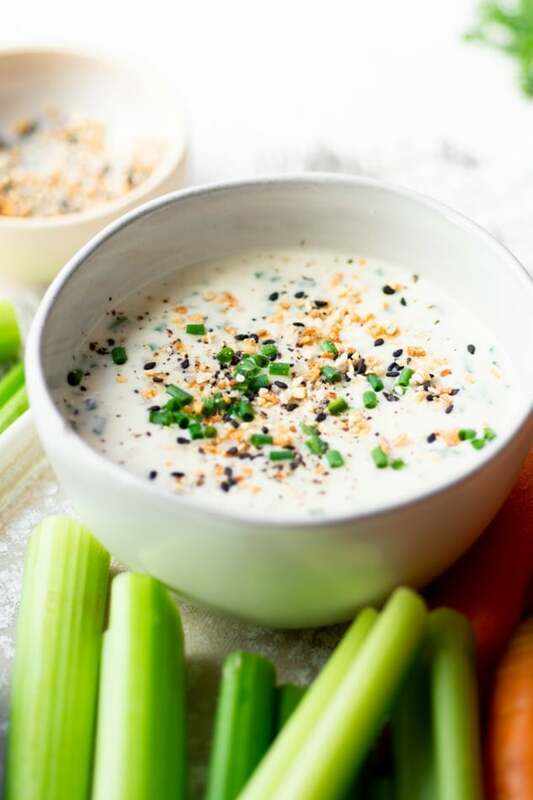 but with a few yummy extras that come along with everything bagel spice like poppy seeds, sesame seeds and some flaky sea salt that take a homemade ranch dressing to the NEXT LEVEL. And all with a simple sprinkle from a spice jar. 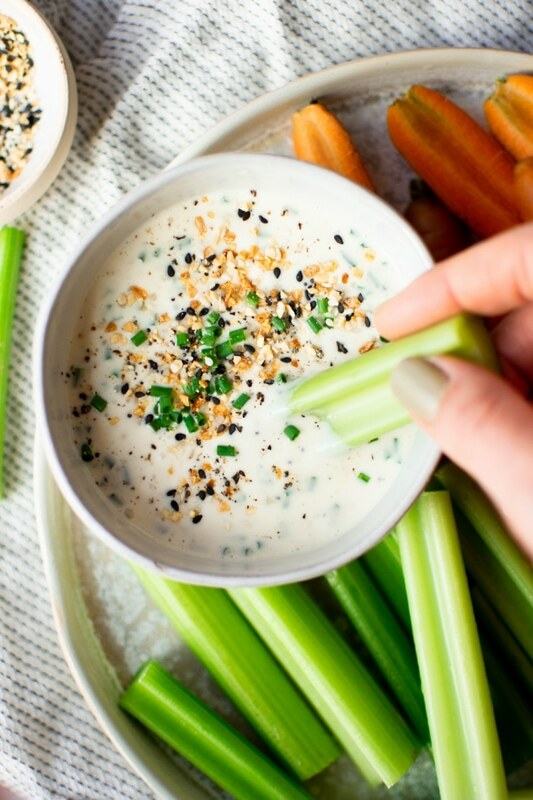 Maybe we could call it the lazy girls next level ranch dressing? Shortcuts are always welcome in a real food kitchen. I’ve tried some different versions of homemade dairy free ranch dressing but this one is by far my favorite. It is mayonnaise based, so you’ll definitely want to get your hands on (or make!) a clean mayo. I always opt for an avocado oil mayonnaise. Chosen Foods makes my favorite version – it’s paleo + whole30 friendly and so freaking delicious. They also recently released a vegan mayonnaise using aquafaba (chickpea cooking liquid!) that seems like an excellent soy free option for any plant-based eaters out there. I haven’t tried it but it’s on my list! If you have tried it leave a comment below and let me know your thoughts! There’s also a good number of recipes online for homemade avocado oil mayonnaise that you can find with a quick search! 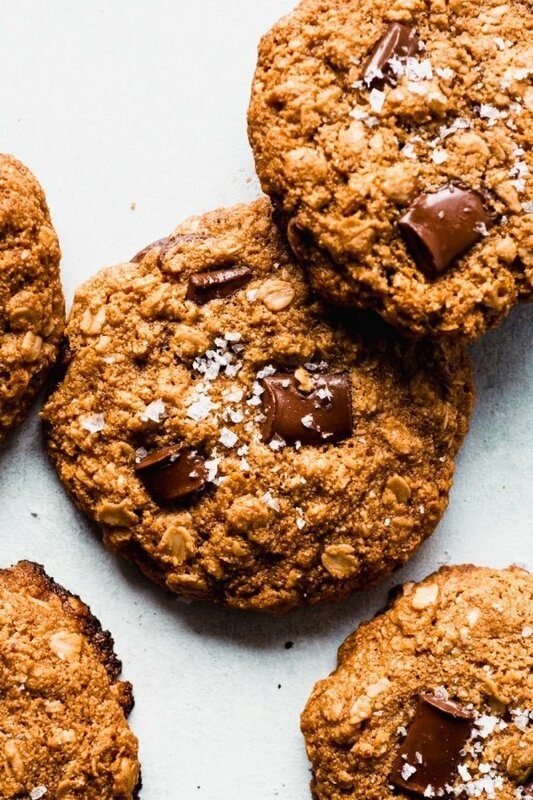 Just be mindful that homemade versions don’t last as long in your refrigerator as a store bought version. It is really so so easy. 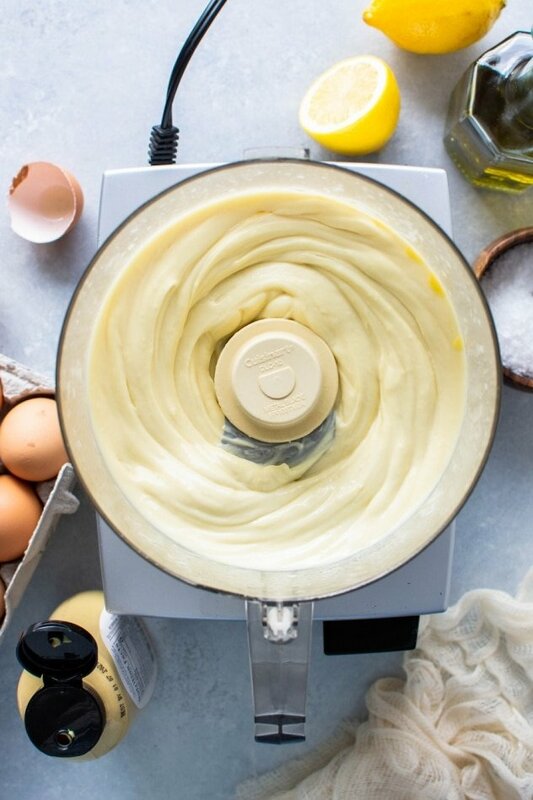 Just add everything to a small bowl and whisk it together – your healthy mayonnaise, some herbs and spices, a little vinegar and lemon juice, fresh herbs for good measure, and water to thin it to your desired consistency. I definitely recommend including the fresh herbs – they add that something special to this ranch that you don’t wanna miss out on! I usually just end up adding whatever herbs I already have on hand – but parsley, chives, cilantro and dill are all great choices. I use the everything bagel spice from Trader Joe’s in this recipe because it’s so good (FLAKY SEA SALT!) and very convenient, but some other companies also make the same blend. If you want to make your own everything bagel spice blend you can easily find a recipe online – just make sure to make extra because you’re going to want to have it around after you try it  and don’t forget the flaky sea salt! It really makes all the spices pop with flavor. You can make the ranch as thick or as thin as you’d like by adjusting the amount of water you add. 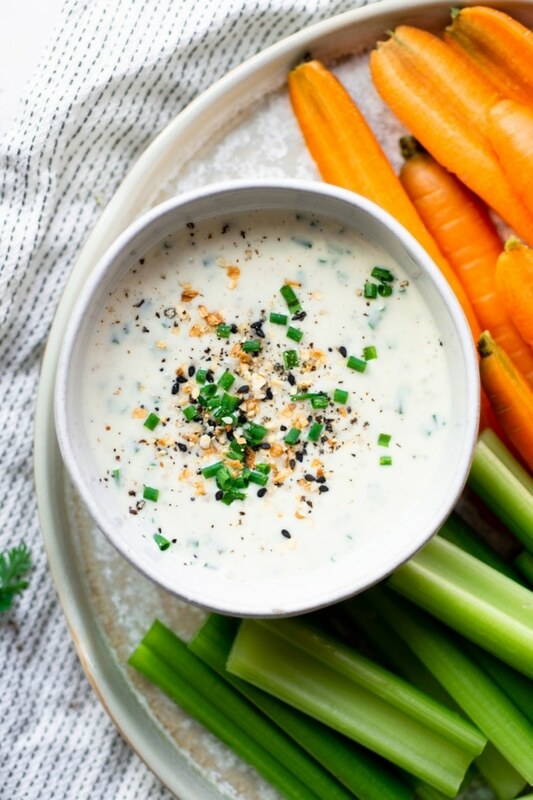 I like a thicker ranch dressing for dipping vegetables and other things, but prefer it a little bit thinner for dressing salads. That part is up to you! It can be! If you’re making a homemade version and starting with the best ingredients then you’re on the right track. 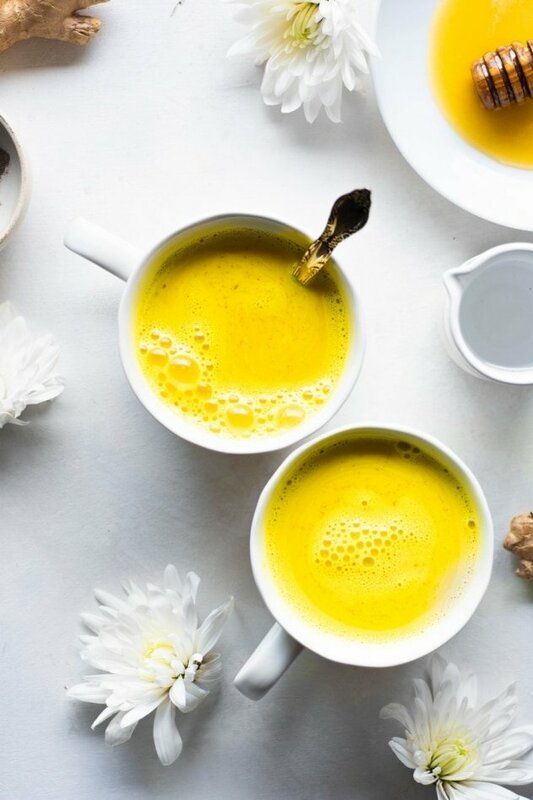 That means leaving behind the highly processed vegetable oils, dairy, and preservatives and replacing them with high quality fats that are good for your brain and body, and fresh herbs and spices from your pantry and refrigerator. Because eating crazy delicious gluten free + paleo foods does not mean giving up the foods you love. It’s as easy as investing a few extra minutes in your kitchen and swapping out the not-so-good for the good ingredients. Salt to taste if necessary – keeping in mind that the everything bagel spice mix from Trader Joe’s does have salt in it already! Add all ingredients to a small bowl except for water and whisk together. Add water 1 tablespoon at a time until desired consistency is reached. 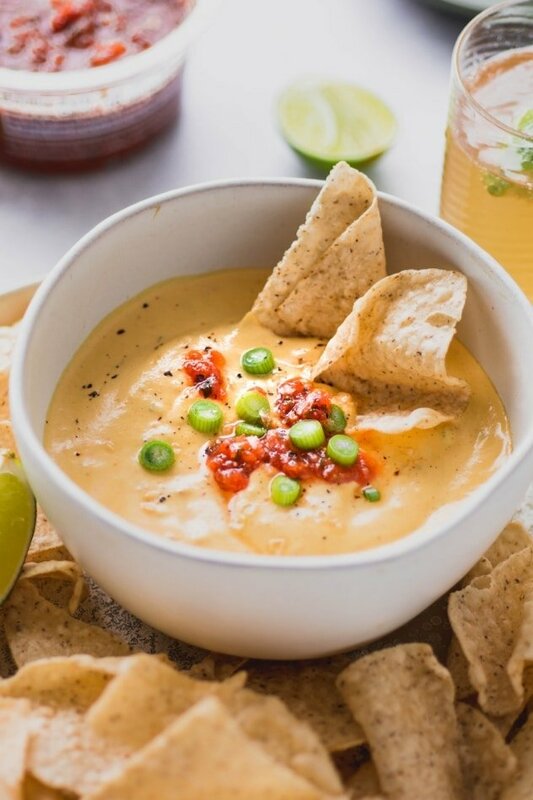 Serve immediately or store in the refrigerator for up to a week! 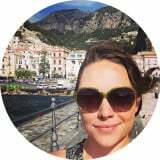 This entry was posted in dressings & sauces and tagged dressing, easy, everything bagel spice, gluten free, grain free, paleo, quick, refined sugar free, salad, vegetarian, whole30 on November 6, 2018 by Nyssa Tanner.